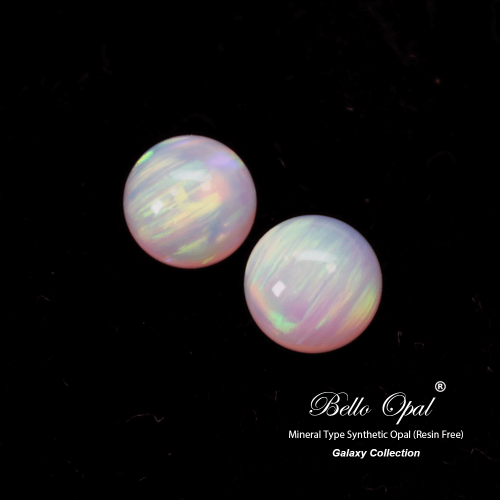 Bello Opal® Galaxy Collection (Mineral Type Synthetic Opal) is composed by silica & very small portion of water. It is the only glass compatible opal among three collections. You may also call it “Galaxy Opal or Created Opal”. It is available in 13 opal colours, such as water opal, milky opal, black opal, blue opal, pink opal and fire opal. Each piece of Bello Opal round bead has two different kinds of fire pattern, and while rotating; there will be various of magical brilliance and gorgeous colour, with attractive colour changes. *Representations of colours are approximate, due to the limitations of photographic and discrepancy of different computer monitor. If you would like to see the actual opal colour, please purchase the sample colour chart.